Mo LoBeau, 11 years old and rising sixth grader, is smart, sassy, spunky, and ready to take on the world. After washing into Tupelo Landing, NC, 11 years ago during a hurricane and raised by the Colonel and the eccentric Miss Lana and helping to run their café, Mo didn't think her summer was going to be any different than any other, spending time with her best friend Dale and continuing to search for her Upstream Mother. That was before the murder. And the kidnapping. And the bank robbery. And Detective Starr. And Dale becoming the prime suspect in the murder. And another hurricane. This is a laugh-out-loud funny books in some parts. Mo and Dale's friendship is hysterical, and their banter back and forth is some of the funniest bits in the book. Mo's no-nonsense sensibility is great.I really liked Turnage's message that sometimes family doesn't have to come from blood; the people around you and who care about you and take care of you can be just as strong a family as your biological one, sometimes more so. That may have been the best bit of the book for me, the care, understanding, and love that the Colonel and Miss Lana have for Mo. 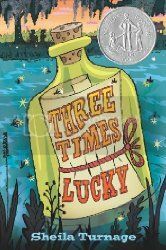 I've heard that Sheila Turnage is working on a sequel to Three Times Lucky, and I'll be sure to be picking that up when it comes out to read more of Mo's adventures.